I’m sure you’ll agree that getting plenty of website traffic is great. But the truth is it’s all worthless unless these visitors convert by buying something, signing up for a newsletter or contacting your business etc. The problem, however, is that visitors often get distracted before converting. Their computer crashes; their boss strolled by their desk or they simply ran a last minute check on their bank balance and canceled the purchase. That doesn’t mean they wouldn’t try again… providing that you bring them back to the site. And that’s where retargeting comes in. The trouble is that you can’t always use it. Not being able to install the retargeting code on a site for instance, pretty much hinders any attempt to create a remarketing list. Or does it? Well, turns out you can retarget visitors even if you can’t include a retargeting script on your website. How? By adding it to your links instead. And in this post, I’ll show you how retargeting links work and how you can use them to improve your marketing efforts. In case you don’t know what retargeting is, let me go over that very quickly. Retargeting – often referred to as remarketing as well – is an advertising method in which website owners can “re-attract” previous visitors who indicated their interest in a product or service but for some reason abandoned before converting. Retargeting is a fairly straightforward practice. In a nutshell, the whole process looks like this: When someone visits a site that uses retargeting, a cookie file is placed on their browser. This allows an advertiser to identify and target them with relevant ads when they visit other sites. There are some amazing retargeting platforms that take care of all the technical aspects of the process: leaving the cookie file in a visitor’s browser, building a retargeting list and displaying the ads. And, retargeting works… According to Wishpond, visitors who are retargeted with display ads are 70% more likely to convert. The average click-through rate of retargeting ads is also 10 times higher than ordinary display ads, it says. You might publish YouTube videos to guide your audience step-by-step through a process they’re having difficulty with. You might refer them to articles with useful and relevant information or news for your industry. Or you might share infographics that highlight specific issues your audience might feel strongly about. Since a lot of this content isn’t yours, you end up sending traffic to third party sites… … And lose the chance to market to these people. Using retargeting links when sharing content to other websites on social media allows you to capture this traffic for your retargeting lists. You can then target them with relevant ads based on links they clicked on, promote your content or attract them to your site in any other way. Whether you link them to a review of one of your products or an industry article closely related to your services, you’ll be able to target them with ads about the relevant product or service and build on what they’ve already read. As an affiliate, you send visitors to someone else’s website. By doing this you’re handing them over the traffic along with all its marketing potential. In most cases, once someone clicks on your affiliate link, they’re gone. You can’t reach out and re-attract them to the product anymore. The site owner, on the other hand, can reap all the benefits of this new traffic. They can add those visitors to their retargeting lists for instance or try to target and convert them in many other ways. All while you have to go and look for new visitors again. Using retargeting links, however, gives you an opportunity to retain that traffic and continue promoting the product to them. You target visitors who might be interested in a particular product. Run Adwords ads, send information about it to your email list or drive traffic to your affiliate site from search. In every one of those places, you include an affiliate link pointing to a page where they could buy a product. But, instead of using the affiliate link you got from the site you’re promoting, you also attach a retargeting pixel to it. Now anyone clicking on it will not only be redirected to the site but also, added to your retargeting list. You’ll be able to display ads promoting the product and remind those who previously clicked on your link of their interest in it. Gives you no access to their website, whatsoever. You can’t change the content or add additional pages to make it more interesting. Or modify the layout to make it more enticing for visitors. And there’s simply no chance you would be able to add a retargeting script to it either. You want to display ads to drive higher brand awareness among visitors who viewed the homepage. Target action driven ads to people who browsed your client’s products list. Display highly specialized ads to people who have abandoned their shopping cart. But it’s impossible without being able to install a tracking pixel on the site. This is another example situation where retargeting links become useful. With just a couple of clicks, you can create a link that contains a retargeting code and use it in your marketing activities to drive traffic to the site. You can include it in Adwords ads, in social media posts or in native advertising and content marketing campaigns. Now anyone who visits the site through that link will be immediately be added to a retargeting list allowing you to target them with relevant ads on other sites. Even though you might perceive them as competitors, being able to sell directly to their customers is an invaluable opportunity for your business. After all, more and more customers prefer to have the option to buy through multiple channels. Econsultancy, for instance, discovered that customer demand for multichannel retail is growing. 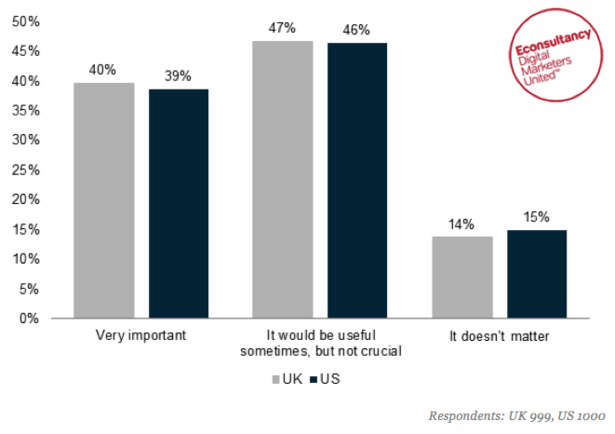 When asked, “How important is it to be able to purchase from a retailer on different channels?” 40% of UK and 39% of US participants responded “very important”. “[…] retailers embracing multiple channels to serve customers will be some of the most successful ones in 2015”. Selling on marketplaces gives you an opportunity to reach customers who wouldn’t otherwise have found your site. Fact: Today’s shoppers prefer to use Amazon over Google when searching for products. And even if they did use the search engine, given the fierce competition in SERPs, they might still not reach your store through the channel. They also give you a chance to take a less recognized brand and put it in front of thousands of potential customers. This is especially important if you’re only launching a brand or products to the market. The cost of reaching initial customers through marketplaces will be lower than launching a powerful marketing campaign to attract new visitors to your site. But the downside to marketplaces is they don’t give you the option to retarget visitors who browsed through your products on their site. However, that’s where retargeting links become useful. Any time you drive traffic to your marketplace listing, be it through Adwords ads, Facebook ads or email newsletters, you can include a retargeting link adding people who’ve clicked it to your list. Technology itself isn’t always what prevents you from being able to use retargeting. But access to it might be. Just imagine that you work for a large hotel chain. You’ve just been given the go-ahead to launch a last-minute campaign targeting visitors who need accommodation for an upcoming event. This is a time-sensitive campaign and, as part of it, you want to use retargeting to increase your chances of getting those bookings. But the problem is it takes the IT department a couple of days to install a tracking pixel on the site for you. And that’s the time you simply don’t have. You can wait for the IT department to install the pixel but by then many sales might already be gone. Or you could launch the campaign without the retargeting component. And in both cases, you might lose many potential bookings. With retargeting links, you can launch your campaign on time and still be able to retarget any site visitors that come to your site. Email is one of the best converting marketing channels. And there’s plenty of statistics to prove it. The average ROI from email marketing, for instance, is $44.25 for every dollar spent. And according to ConvinceandConvert, 44% of email recipients made at least one purchase based on the recommendation of a promotional email they received. But the problem is that not every link you include in an email points back to your site. You could be using email to promote affiliate products. Or to share useful content from around the web. In spite of that though you might still want to target them with relevant offers based on their behavior. If you include a retargeting script in those links, you can target a person with ads based on the links they clicked. The process is actually quite simple. I’ve already described how it works on the user’s end. Now let’s look at the technical aspect that puts them into play. To create a retargeting list, you normally add a small snippet of code from the ad platform you’re using to your website or app. Then in the ad platform, you create a retargeting list that will include users identified by specific behavior on your site. So you could create a list of people who have visited a specific product page or have abandoned their shopping cart. Then, you build a campaign of ads that each list will see. So those who visited a specific product page might see ads about that product. Retargeting links work in a similar way. The only difference between the two is that with links you don’t need to add the retargeting code to your site. It’s included in the link instead. Once you create a retargeting code in your platform of choice, you simply attach it to your link to create a retargeting link. You still have to create a retargeting list and follow all the other steps of the process. But now the cookie file will be added to a user’s browser when they click on a link, rather than when they visit a specific page. To find out more about the process, check out this guide to creating retargeting links by ClickMeter, which is a tool offering this functionality. What do you think, would retargeting links be useful to you? Have you ever used it before? Share your opinion with us in the comments. Originally published: July 16th, 2015. Hi there, I’m Pawel Grabowski, a lead generation copywriter and content writer based in rainy but beautiful Ireland.